Sometimes I wonder how time just seems to slip away! I had been doing so well with my writing and then BAM! I spend a weekend away, get slapped with a little writer's block, and next thing I know I haven't written anything in over a week. Please tell me I'm not the only person to feel there aren't enough hours in a day and that this year has just flown right by. I'm hoping that with my upcoming trip to Asia in a few weeks that I'll be able to get back on top of my writing. Anyway, I recently went on my first trip to South Australia. As stated in a previous post (Dragon Heads, Koala Cuddles, and Sick Days), I had been planning to go to South Australia to actually hold a koala. This is what sparked the initial plan to visit Adelaide. 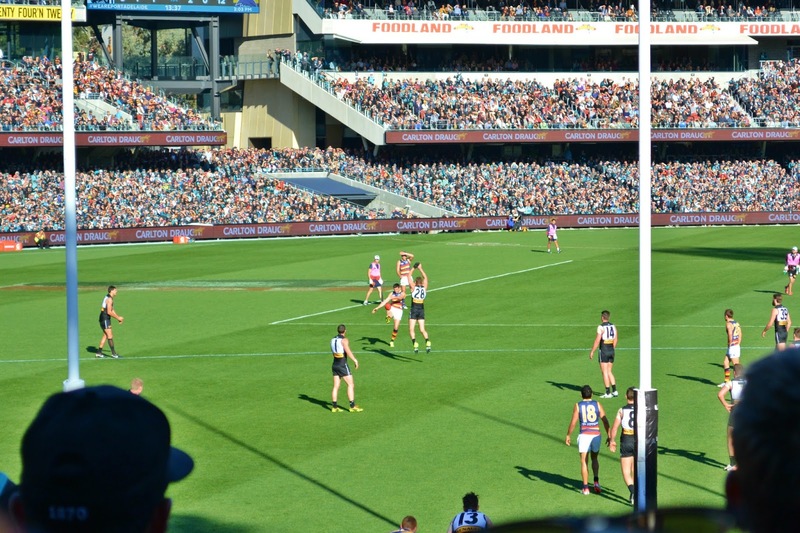 We planned the perfect weekend to visit because it was the Port Adelaide vs. Adelaide 'Showdown'! Holding cute, cuddly koalas and footy! Is there anything more Australian? Adelaide reminded me a lot of Reno in the sense that it's a "big" little town. As the capital of South Australia (side note: why is it South Australia? There's Western Australia and Northern Territory so why South instead of Southern? ), one would expect it to be comparable to Melbourne or Sydney. However, Adelaide was very quaint! Much like towns in the south, most shops weren't open on Sunday, and everything seemed to close early. Maybe a Pelican dancing in the spotlight? This is where we went to hold the koalas. It's about 30 minutes outside the CBD but totally worth it! There is a zoo within the city of Adelaide. If you hold a zoo membership in Melbourne, you're able to use this in Adelaide as well. However, I do believe there is an extra cost to hold the koalas. At the Gorge Wildlife Park, it is only $15 to enter with NO ADDITIONAL COST to hold the koalas! Not only are you able to hold the koalas, but there are also quite a few other animals that you're able to interact with included in the price of admission. Although it was a smaller wildlife park, I must say this is my favourite I've seen in Australia thus far! Maybe it was because we went to Port during the winter, but it seemed pretty much like a ghost town. HOWEVER, do not let this deter you from visiting. The city was actually kind of cool, although almost everything was closed except the pubs. Be sure to keep a close eye on the water, and you're sure to see a dolphin or two! From Port, make the short trip down to Semaphore. Palais Hotel is a perfect place to catch a sports game or grab a quick bite to eat before watching the sunset over the ocean. Anyone who is everyone is out on Hindley Street on a Saturday night. Just past Rundle Mall, both sides of the street is lined with pubs, bars, and clubs. If you're unsatisfied with one venue just walk a couple of steps and try the next! Hindley Street has various locations to grab a bite to eat before partying the night away. We ate at the Black Bull Hotel. Honestly, the food was pretty good for pub food! The hotel also doubled as a nightclub. Once we finished eating, we just walked upstairs to hit the dance floor! Looking for a place where you won't hear "Doof Doof Doof" ringing in your ears for the next day and a half? Try one of the laneways. Peel Street had some pretty impressive bars that weren't too crowded and had a great atmosphere! Two local teams always lead to a fantastic rivalry! 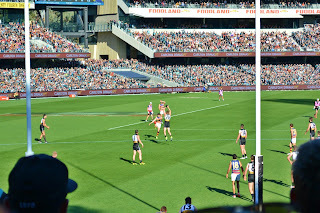 After the death of Adelaide's Head Coach Phil Walsh, I was afraid the match would be quite a sombre event. Before the game, both Adelaide and Port Adelaide fans came together and marched from Rundle Mall to the Adelaide Oval to honour the late coach. The stadium was absolutely packed with fans (the largest attendance ever in the stadium). The game was one of the better I've ever seen! Both teams were playing to win, and it was friggin awesome! I didn't even care that Adelaide won and totally screwed my tips for the week (so close to a perfect week...so close!). 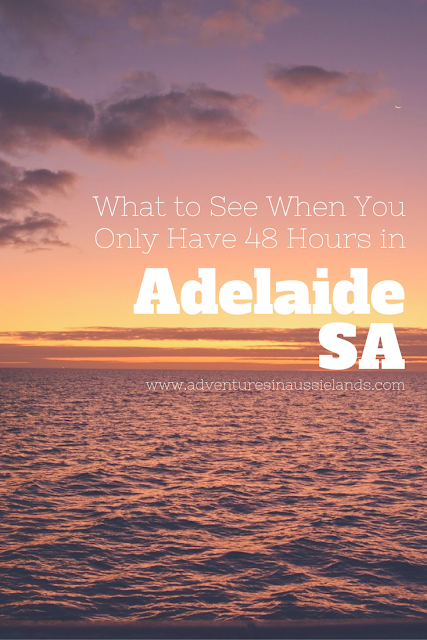 Although Adelaide is no Melbourne, it is still a great place to visit! Definitely planning to go back to Adelaide in the future and explore more of South Australia. If you've ever visited South Australia or Adelaide (or have heard of some excellent places to see there), let me know so I can be sure to add them to the list and write about them in my next Adelaide Adventure! Awesome experience! It sounds so much fun. I'm an aspiring traveler so I hope I can go there very soon. Don't be afraid to get out there and explore! Travelling is amazing and you don't even have to go too far to explore new things and places. I would love to hold the Koala like you have! It's such a cool experience. Definitely add it to your bucket list. Love Australia it looks amazing place to visit, because is far from where I live I could not have the experience yet to visited but I will make it one day with my kids. thank you for share your amazing experience. It's such a cool country to visit. There's been some really good flight deals from the UK to Melbourne recently so maybe you'll get to take your trip sooner than you think! This is a great article! It's a good thing that they allowed tourists to touch animals. I would love to hold a koala too! It's illegal to hold them in Victoria which is the main reason we went to Adelaide. It was such a cool experience. Great information. We are hoping to visit the area next year so this was useful to us! Awesome! Hopefully this have you some ideas for an awesome trip! I went to Aussie for my honeymoon it was great! Australia is fantastic. But it's just so big. Hard to see everything in one go. Can't wait to visit Adelaide it looks great with lots to do! Moving to Australia so will definitely be visiting - will pin for future use! How exciting! Where in Australia are you moving to? Adelaide is pretty awesome but I definitely have a bias towards Melbourne.